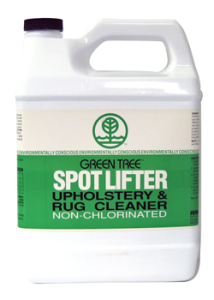 Finger Lakes Spotlifter™ will remove grease, tar, gum, and dirt quickly and safely from fabric. It features a biodegradable formula that is phosphate free, noncorrosive, non-caustic, non-flammable, has low toxicity, and contains no regulated VOCs. Spotlifter™ contains a terpene base with a flash point over 212°F. There are no ozone depleting chemicals in the formula. It can be used as pre-spotter, before cleaning or as the primary cleaner in a diluted form. A small area of the fabric should be tested prior to general use to assure material is colorfast. 2. Let set for 1-2 minutes. 3. Damp sponge or brush off. 4. For gum, put small into center of gum. Spray Spotlifter™ , covering all of gum. Wait a few minutes, scrape gum up with spatula.